Joseph who is now a leader in Egypt, is united with his brothers, and he forgives them. THE LAND OFCanaan, where Joseph’s father and brothers were living, was one of the countries afflicted by famine; so, when they heard that there was corn in Egypt, Jacob sent his sons there to buy some. 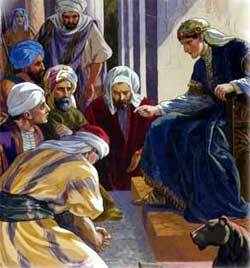 They did not know, and bowed down before him, that he was their brother whom they had sold for a slave. But Joseph knew them, and treated them roughly, telling them they were spies. They answered him that they were no spies, but honest men–twelve brothers, one of whom, Benjamin, the youngest, was with their father in Canaan; and another, Joseph, was dead. But he said that the only way of proving themselves honest men was for one of them to go and fetch their youngest brother, while he kept the others in Egypt. And, having said this, he put them all in prison for three days. On the third day they were brought before Joseph again, and then he told them that one of them must be left in prison, while the others carried corn to their father, and brought back their youngest brother. When they heard this they were greatly distressed; and they said to each other that now punishment was coming upon them for their cruelty, a long time ago, to their brother Joseph. Joseph wept when he heard his brothers speaking in this way, for he understood what they said, though they did not know it, as he spoke in different language from theirs. Then he sent them away with corn, keeping Simeon till they returned with Benjamin. Jacob was very unwilling to let him go; but their corn was soon done, there was none to be had anywhere save in Egypt, and Joseph had said they should not have any more unless Benjamin were with them. So he was obliged to send him. When his brothers came again, Joseph entertained them very kindly at first, but presently he made as though he would keep Benjamin for his slave. Upon this, Judah, who had promised to take care of Benjamin, pleaded so earnestly, offering to be a slave in his place, that Joseph told them he was their own brother whom they have sold into Egypt. Then he sent for his father, and made them all live with him in the land of Egypt.